Team Biocraft presents their concept for repurposing the woody debris on forest floors at the spring 2017 Innovate to Grow. Innovate to Grow (I2G), the School of Engineering’s showcase for senior capstone projects and student ingenuity in engineering and entrepreneurship, is emerging as a twice-a-year event, thanks in large part to a $50,000 donation from Wells Fargo. Scheduled for Dec. 15, this fall’s I2G will highlight the efforts of 13 teams presenting the results of their capstone projects. This fall event is the counterpart to the spring semester event that’s been held annually since 2012. The date for this year’s spring I2G is May 11, 2018. The goal of the capstone project is to provide graduating seniors with hands-on, real-world experience that they don’t get from the classroom alone. Students assemble into teams with peers, faculty mentors, and external partners to tackle specific engineering challenges. 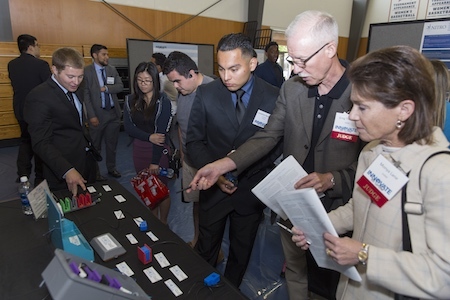 Students explain their capstone projects to judges at the spring 2017 Innovate to Grow poster session and prototype expo. 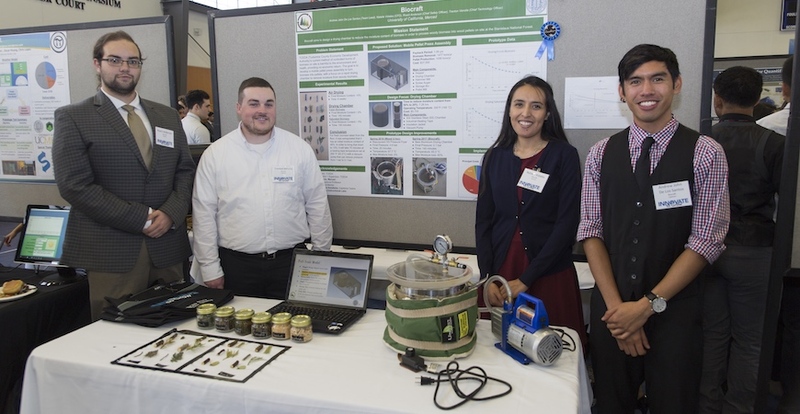 As in previous years, this fall’s teams worked with corporate, government and nonprofit partners — including major regional players like E&J Gallo, Del Monte, UCSF Fresno and the Turlock Irrigation District — to solve a variety of real-world engineering challenges. Some teams also worked with partners outside the Central Valley. One team, working jointly with San Diego County and the UC Division of Agriculture, is working to replace potentially harmful chemical pesticides with controlled hot water treatments. Another team is working with the Australian company T3 Energy, in collaboration with Super Insulated Green Building Technologies of Flagstaff, Arizona, to develop green bricks – building materials that are both load bearing and insulating. It’s technology that would bring down construction costs while maximizing energy efficiency. I2G’s expansion into fall mirrors a school-wide trend to accommodate ever-increasing numbers of fall graduates. This semester, for example, marks the first time in university history that fall graduates will get their very own commencement ceremony. Innovate to Grow is free and open to the public. A complete schedule of events and a map of event locations can be found here. Further information on Innovate to Grow can be found on the I2G Website. Parking for the event is available at Lake Lot 2. Any additional questions about the event can be addressed to D.B. Quan at the School of Engineering.